It's time for this month's MFT Hits & Highlights DT Challenge, where we highlight some of our favorite products and explore innovative ways to use them. For today I made a triple slider card using the Fab-BOO-lous Friends stamp set & Die-namics, the Frightful Friends stamp set, the Surf & Turf Die-namics, and the Slider Elements. To create my background I blended some Distress Inks (the colors I used are listed at the bottom of this post), spattered white ink, then stamped the fences and bats. The slider channels were cut with a die from the Surf & Turf Die-namics. The sentiment was white embossed on a Purple Rain panel cut with the Stitched Fishtail Sentiment Strips Die-namics. Watch the video below to see how I created this card. Click HERE to watch it on YouTube. Head on over to the MFT blog to see what the other DT members have come up with for today. It's time to shop! The X's and O's Card Kit and the Witch Way Is the Candy stamp set & Die-namics are available for purchase now! I'd like to share a shaker card that I made using the Witch Way Is the Candy stamp set & Die-namcis. I went with a pastel color scheme, It's unusual for a Halloween card though. I made a cloudy sky using the Cloud Stencil with Bubblegum and Grapesicle Premium Dye Inks, and framed it with a Single Stitch Line Rectangle Frame. I used some Queen & Co. Topping Diamonds (so pretty!) and Sparkling Clear Stars sequins for my shaker. The sentiment was stamped with Safety Orange ink to match with the pastel colors. The patterned paper is from the Itsy Bitsy Polka Dots Pastels paper pack and it was cut with a die from the Blueprints 27 Die-namics. Thank you for stopping by! Happy shopping! It's Day 2 of the MFT August Card Kit Countdown. The X's and O's Card Kit will be available for purchase TONIGHT at 9:00 pm EDT! I paired the X's and O's Card Kit with the Adorable Elephants stamp set and made a shaker card. The Square Shaker Window & Frame Die-namics and Square Shaker Pouches make it pretty easy to create a shaker card. I die cut X's and O's with the Tic Tac Toe Die-namics and used them as shaker components along with some sequins. I added a cross-stitch line to the top edge of my main panel using the Basic Stitch Lines Die-namics to add more X's. I sponged some Bubblegum ink behind the elephant and added the tiny hearts for more love. Head on over to the MFT blog to see the full reveal of the kit and for more inspiration from the DT. ** The links to the new products won't work until the Release Day (Aug 22, 9:00 pm EDT). MFT August Card Kit Countdown Day 1 and...Exciting News!! 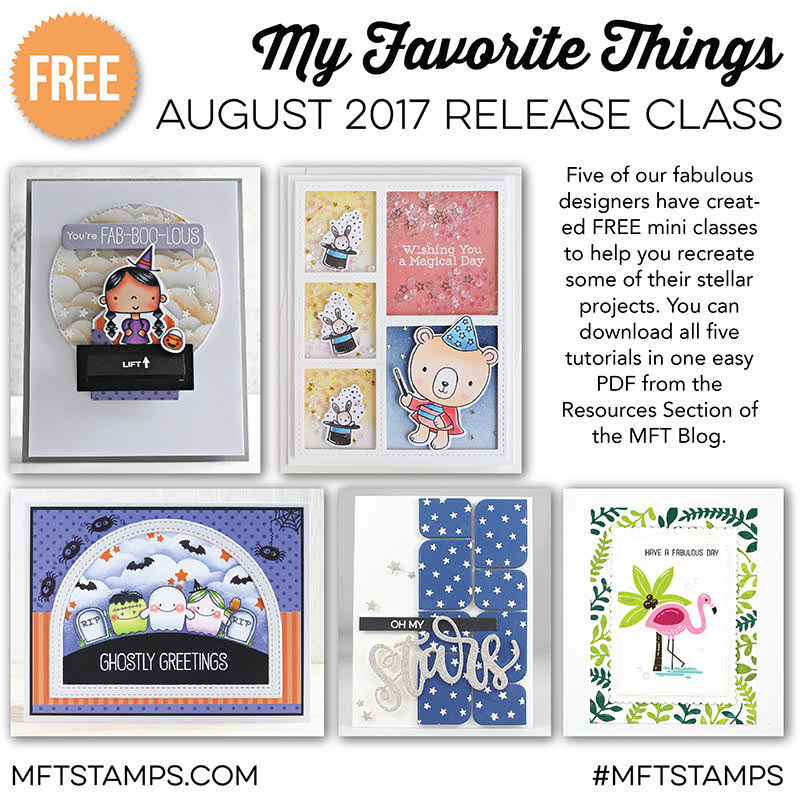 It's time to begin the countdown to the MFT August Card Kit Release! The new kit is called X's and O's, and it is SUPER CUTE & FUN! It will be available for purchase on August 22nd at 9:00 pm EDT in the MFT store. Make sure you stop by the MFT blog today and tomorrow for the full reveal of the kit and for more inspiration from the DT. And also... I'm extremely excited today because I can finally share this awesome news with you!!! 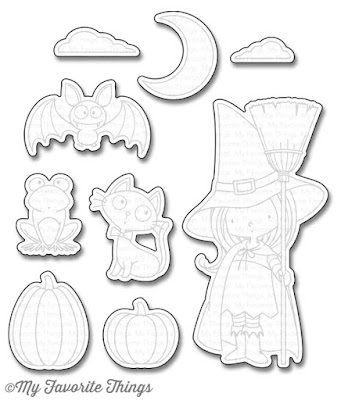 The Witch Way Is the Candy stamp set is coming back!! The Witch Way Is the Candy was retired awhile back, but MFT has decided to revive it with a lot of requests from customers! I'm really really happy that my old set is still loved so much and MFT listens to the voice of their customers. Thank you so much for your support to my Birdie Brown stamp line, and I'm grateful to MFT for making this happen! The stamp set and Die-namics will be available for purchase at the same time with the X's and O's Card Kit. 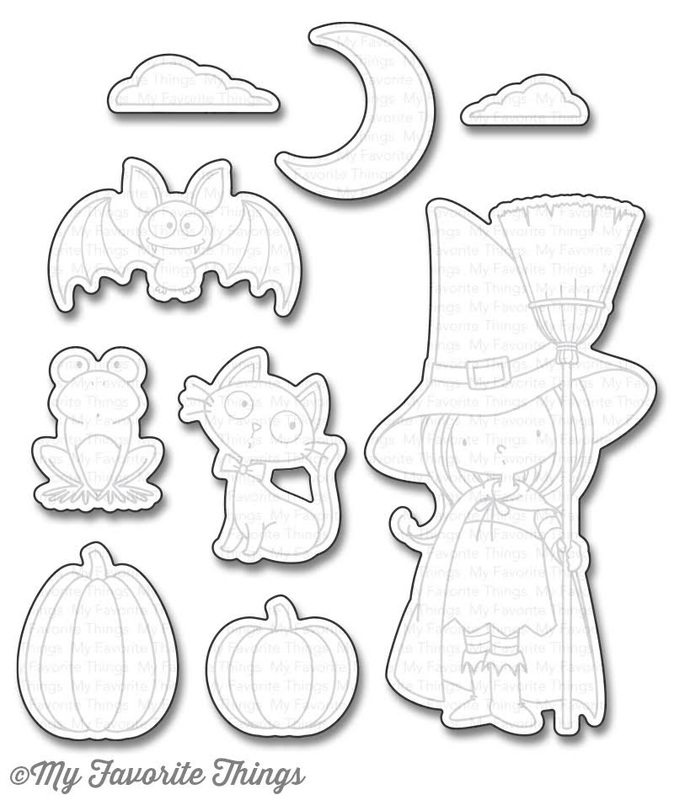 The images in the new Witch Way Is the Candy stamp set are almost the same with the retired one, but there are minor changes here and there - like the line weight of the cat's nose, cat's ears, the stripes on witch's tights, and so on. The font of the sentiments has been changed and a few new sentiments have been added. There is no change on the shape of the matching dies. But the new dies are open inside, not solid. My first card features the X's and O's Card Kit and the Huge LOVE Die-namics, which is the new free with $60 die. The new Tic Tac Toe board shapes included in the kit fit in the Square Shaker Pouches perfectly. And the Mixed Heart Pieces are so cute and versatile! Here is a close up photo of the Tic Tac Toe board showing you its thickness. The "LOVE" was die cut out of striped paper that I made using card stocks included in the kit (Razzle Berry, Poppy, and Wild Cherry). My second card uses the Witch Way Is the Candy stamp set. To create the background, I cut a panel of Blueberry CS, inked it with Nightshift Blue ink, and spattered some white ink over it. I used the Birch Trees and the Solid Birch Trees Die-namics for the wood scene. I added the tiny spots beside the embossed sentiment using Nuvo Crystal Drops (Ripened Pumpkin). Thank you so much for your comments and advice on my first tutorial video. Your warm words encouraged me! This time I filmed the process of my coloring on the witch. I don't think I'm an expert on coloring with Copic Markers. You'll see how many times I go back and forth and how long it takes me to finish one image, then you will understand why I say I'm not an expert. LOL! Head on over to the MFT blog for more info about the new kit and the Witch Way Is the Candy stamp set & Die-namics. It's time for a Creative Construction with Blueprints Challenge over at the MFT Challenge & Inspiration blog. As it was announced last month, this challenge has moved from the MFT blog to the MFT Challenge & Inspiration blog, and it's open to anyone who wants to participate! Remember that you have a chance to win a $50 gift voucher with joining the challenge. This month we're featuring Peek-a-Boo elements. I chose the Blueprints 30 Die-namics to create my card for today. The main frame die in the Blueprints 30 cuts an interactive flap, which is a good place to hide a gift card or a surprise message. I added a circle Peek-a-Boo window to the flap so you can take a peek of what is inside. To create my front panel, I cut Spearmint CS to 4-1/4" x 5-1/2", inked lower half of it with Cracked Pistachio Distress Ink, and added ink spatters with Cracked Pistachio and white inks. After it dried, I cut the rounded rectangle frame and the circle window using the Blueprints 30 Die-namics. I stamped the monsters from the More Monsters stamp set with Sour Apple and Milk Chocolate Premium Dye inks, and also stamped one of the monsters (the second one from the left) to the Smooth White card base at the same position using my Mini MISTI. I put aside the front panel, then stamped another monster beside the green monster. I stenciled the stars using the Star Celebration Stencil and sponge daubers after I masked the monsters. I adhered the front panel and embellished with silver stars. Head on over to the MFT Challenge and Inspiration blog for the challenge details and for more inspiration from the DT. I hope you'll play along with us! Today the MFT DT is taking a fresh look at our most recent release with inspiring ideas and innovative takes on the complete collection. We love the opportunity to look at our products with fresh eyes, envisioning entirely new ways to showcase the possibilities they present! I have a set of three Halloween tags to share with you that I made using the Fab-BOO-lous Friends stamp set & Die-namics. Do you think these look too simple? Actually these are interactive tags that move as you see in the animated GIF below. Well... I'm extremely nervous today because I'm sharing my FIRST how-to video. PLEASE note that this is my first try to make a tutorial video and I apologize for the bad quality. There is no narration because my English speaking skill is awfully bad, I just added a few captions though. (I know some of you don't like this type of videos.) I will greatly appreciate it if you could take a little time to leave a comment or you gave me some advice on how to improve my video. Head on over to the MFT blog to see what the other DT members have come up with for today! 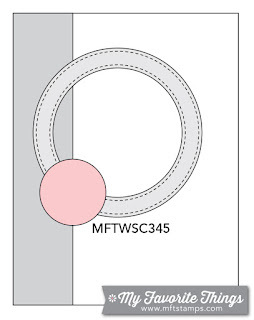 A new sketch challenge (WSC 345) is up on the MFT Challenge & Inspiration blog! My circular frame was cut out of Silver Sparkle Card Stock with the Stitched Circle Scallop Frames Die-namics. I layered three frames for a little thickness. The sentiment was heat embossed with silver embossing powder. As you see in the photo above, I scored four lines using my Scor-Buddy and Teflon Bone Folder since the black panel looked too plain. These lines made a big difference! I also added silver stars here and there to embellish the card. Head on over to the MFT Challenge & Inspiration blog for the challenge details and for more inspiration from the DT. Hope you'll play along with us this week! It's time to shop, everyone! MFT August Release is live now! I'd like to share two more cards using my new stamp set & Die-namics, Fab-BOO-lous Friends. To create my background, I blended Seedless Preserves and Victorian Velvet Distress Inks on watercolor paper, spattered it with some white ink, and cut it with a stitched rectangle die from the Blueprints 13 Die-namics. I made my slide & spinning mechanism using the Downhill Slope Die-namics and a Spin & Slide Disk. The second one is a card I made for this month's Release Class. It's final day of the MFT August Release Countdown. The new products that we have been showcasing this past five days will be available for purchase at 9:00 pm EDT TONIGHT!! My card for today uses the new Big Birthday Wishes stamp set, which was part of the Sending Birthday Wishes Card Kit released in June, the In Bloom stamp set & Die-namics, and the Fab Foliage Die-namics, along with the Split Chevron Cover-Up Die-namics. To create the background panel, I spattered a piece of Smooth White CS with some Blue Yonder and Orange Fizz Premium Dye inks and cut it with the Split Chevron Cover-Up Die-namics. I layered two more die-cut Cover-Ups under the spattered one, then embedded the cut out pieces. I added more details to the stamped flowers and the die-cut leaves with my Copic Markers and a white gel pen. The ink colors I used for the flowers are listed at the bottom of this post. Head on over to the MFT blog to see all the products revealed today and for more inspiration from the DT! Don't forger to leave a comment there for you chance to win a prize! It's Day 2 of the MFT August Release Countdown. We're so close to the release day! All the new products will be available for purchase tomorrow at 9:00 pm EDT!! I have a fun interactive card to share with you today. It features the More Monsters stamp set & Die-namics and the Stitched Collage Frame Die-namics. The More Monsters stamp set is a companion set to the Monster Love stamp set that was released last year. I love these adorable monsters so much! :D I combined them with the new Stitched Collage Frame Die-namics and inlaid colorful piece of polka dot patterned paper from the Party Patterns Paper Pack to each cell. For the two monsters in the upper cells, I added Action Mini Wobble Springs to the back side so they wobble. The other monsters were adhered with Thin 3D Foam Squares. Head on over to the MFT blog to see all the products revealed today and for more inspiration form the DT. Don't forget to leave a comment there for your chance to win a prize!